North East Branch regret to inform you of the death of retired Constable Alan John Simpson, aged 63 years, at his home in Portlethen on 18 February 2019. Alan started his police career with Scottish North East Counties Constabulary on 6th August 1974 at Nairn. On amalgamation in 1975, (when Nairnshire went to Northern Constabulary), given the alternative, his choice was go to that force, as opposed to Grampian. However, in August 1977, he transferred to Grampian as Constable D73, starting at Mintlaw. He served there until November 1979 when he was moved to the Station House, Alford, until July 1981, when he was transferred to Stonehaven. In December 1982, he had a short spell with Traffic there as T67, before moving back to Division in the following August. In April 1993, he was moved south to Laurencekirk where he spent the next six years, returning to Stonehaven in March 1999. 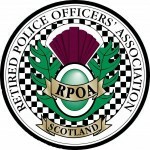 In 2002, he became Court Officer at Stonehaven and was due to retire in 2005. However, he went on to the 30 plus scheme and in office until finally retiring on 18 December 2009, with over 35 years service. Funeral service to be held in Baldarroch Crematorium, Crathes on Thursday, February 28, at 11.30am to which all friends are respectfully invited.